You can import domain zone file records from a third party. 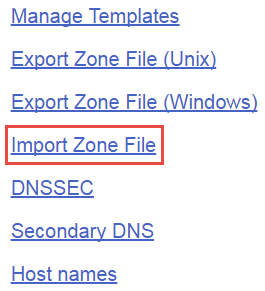 For example, if you want us to manage your domain name's DNS, you can import zone file records exported from your current DNS manager or import a zone file currently in use on a BIND DNS server. The data format follows the BIND zone file format and RFC 1035. We do not support all BIND zone file features, and we only support the import of A, AAAA, CNAME, MX, TXT, and SRV record types. Warning - Importing will merge and duplicate all existing zone records. Click Select Files to locate and open the files you want to import. After importing, you will see the message Records not containing errors have been successfully saved.